Ideal for an omega wire necklace, a nice chain, or enjoy as a lapel pin. Paso Fino horses your favorite? Then look no further! Check it out a Paso fino on the sounding board just like at the shows. 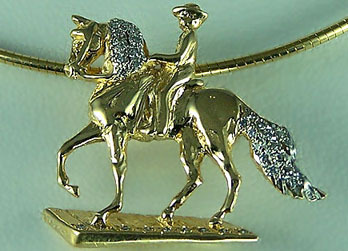 You won't find this piece anywhere else but at The Gorgeous Horse. We have attended your nationals in the previous years and we understand the style and quality you seek in a Paso fino design. Offering .16ct of diamonds in the mane, tail, and a stone in each individual sounding board.